Good morning ghouls and ghosts! I know, I know...I'm about as reliable as a three-year-old rubber band but here I am once again attempting to entertain you. Believe me, once we get closer to publication I'll start posting with more regularity. I might even have something insightful to say, or at least it'll seem that way. Nothing makes a body seem more like a somebody than a tiny dash of "Hey, I know that guy!" Don't worry. I'm not suddenly going to go all celebrity on you. Fame and fortune be damned! I have to stay true to my peeps, yo. 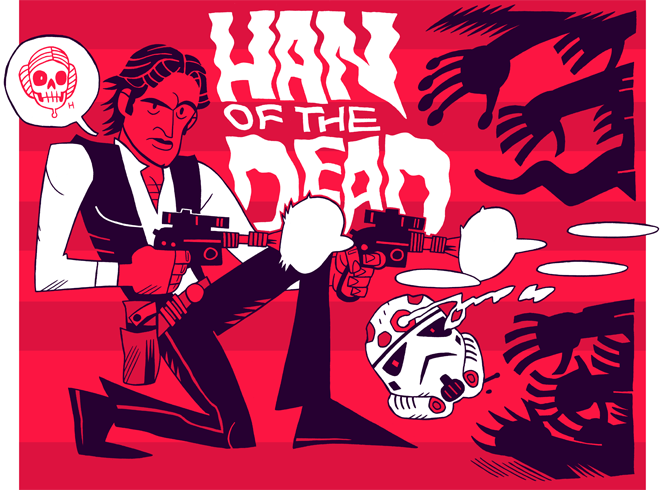 Thus I humbly present the above zombie construction courtesy of Dan Hipp, aka MISTERHIPP, which combines two of my favorite things: Sean of the Dead and Han shooting first.